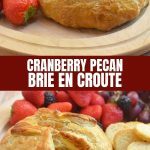 Cranberry Pecan Brie en Croute with creamy brie, dried apricots, and candied pecans baked in a golden flaky puff pastry for an impressive appetizer your guests would be lining up. Perfect for the holiday parties! It’s been two years since I decided to quit my job at a skilled nursing facility and blog full-time. I can’t believe I’m going to say this but I sometimes miss going to work! I love blogging and wouldn’t trade it for any career in this world but I do crave the company of old friends and the daily challenges of my old job especially now that the holidays are just around the corner. Around this time, I would already be knee-deep in planning our patients’ Thanksgiving luncheon and Christmas dinner. This was a part of my job I enjoyed the most; it was always super fun figuring out a party menu that will wow a large crowd. 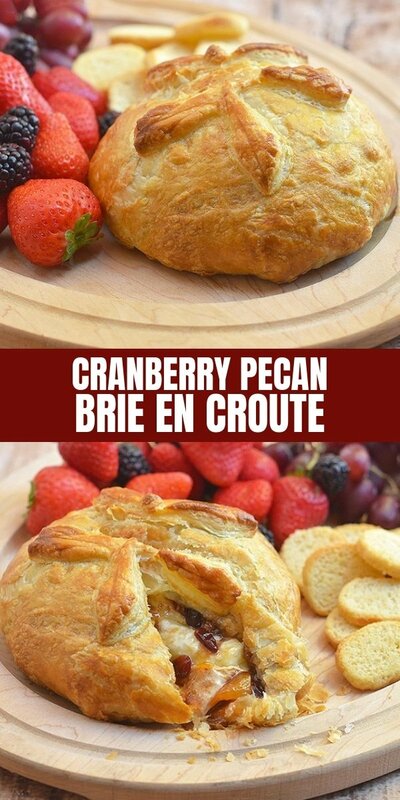 Although I had a great line up of sweet and savory treats such for these holiday parties, our yearly tradition of Brie en Croute was what always drew the most oohs and aahs. There’s just something about this golden beauty surrounded by assorted crackers and fresh fruits that rings in the festive mood of the season. 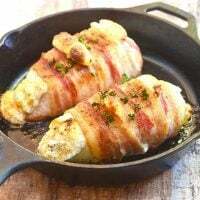 It’s so elegant and impressive yet so quick and simple to make you’ll be the hostess with the mostess with very little effort! 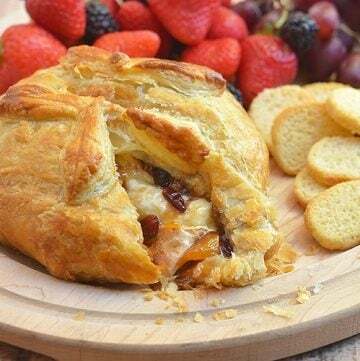 And with a rich and creamy brie cheese encased in a light, airy, and golden flaky crust, your guests will be lining up for seconds. Or thirds! 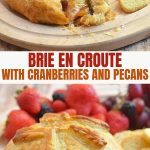 The best part is, Brie en Croute is a versatile dish you can easily switch up with various flavors. 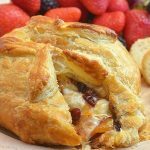 I opted for a “dessert” version this time around, using apricot jam, dried cranberries, dried apricots, and candied pecans, but possible add-ins are practically endless! Check out my suggestions below. 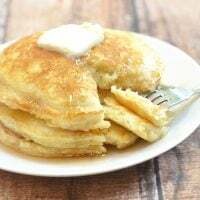 Swap the apricot preserves with your choice of jams, chutneys, honey or even brown sugar. Fig jam is one of my favorites! I’ve also tried Jalapeno jelly and the combination of sweet, spicy, creamy and crunchy is out of this world! Again, play around with different types of fruits and nuts. Dried cherries, pineapples, apples, candied ginger, almond slivers, and/or glazed or roasted walnuts would work beautifully. Soak the dried fruits in red wine, if you like, for another layer of yum. 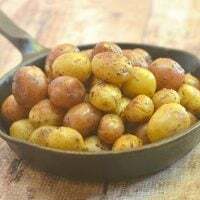 Use roasted garlic and chopped black olives for a savory version. Experiment with pesto, sun-dried tomatoes, tapenade and/or fresh herbs such as rosemary and basil. Try Caramelized onions and roasted mushrooms. Sooo good! 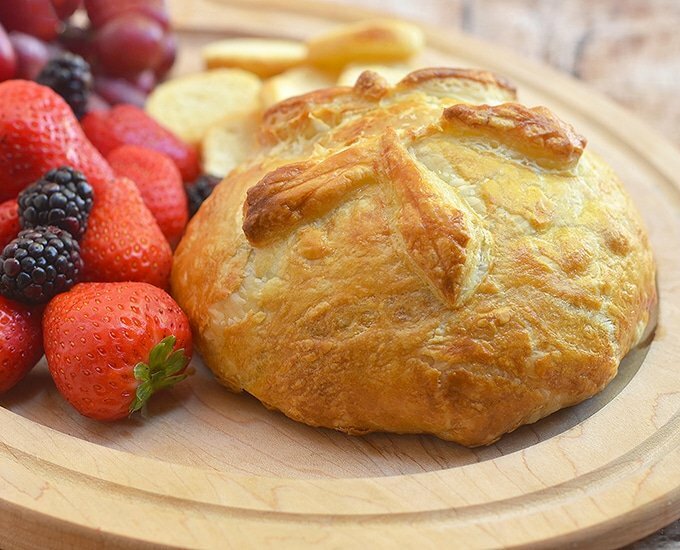 Thaw puff pastry at room temperature for about 30 to 40 minutes or until it's easy to unfold and handle. In a small bowl, combine egg and water and whisk until frothy. Set aside. Using a rolling pin, roll out pastry sheet to about 1/8-inch thick. With a pizza cutter, cut into a round shape of about 6-in diameter, saving the pastry scraps to make leaves. 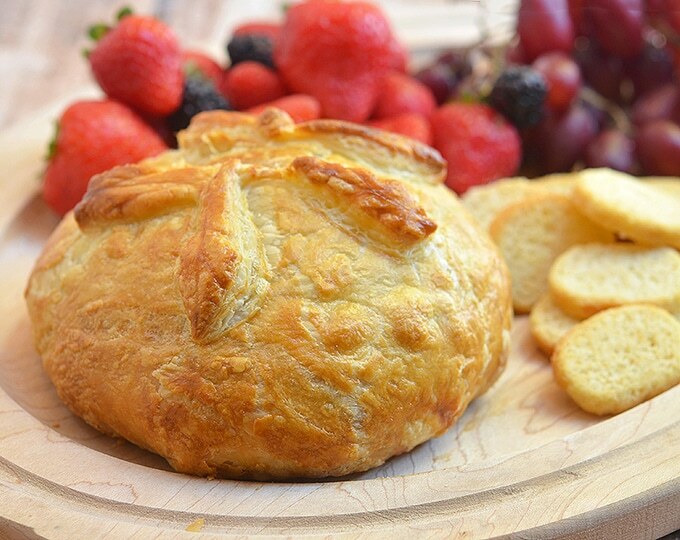 Spread the preserves on the pastry into a circle at about 1/2-inch larger than the cheese. Sprinkle dried cranberries, dried apricots, and pecans. 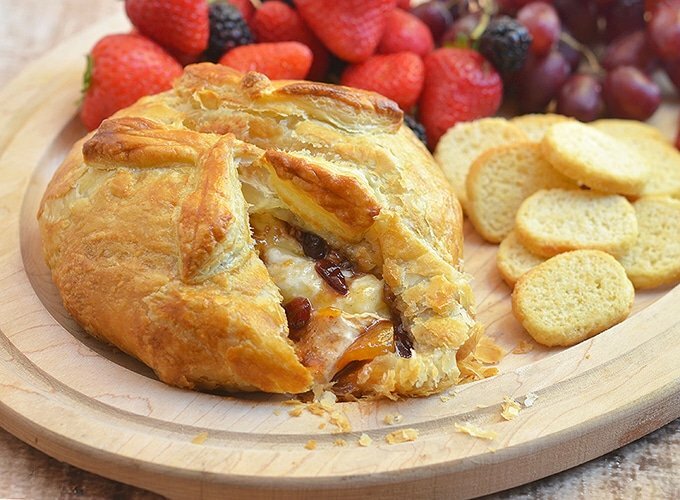 Place the cheese in the center of the pastry over the filling. 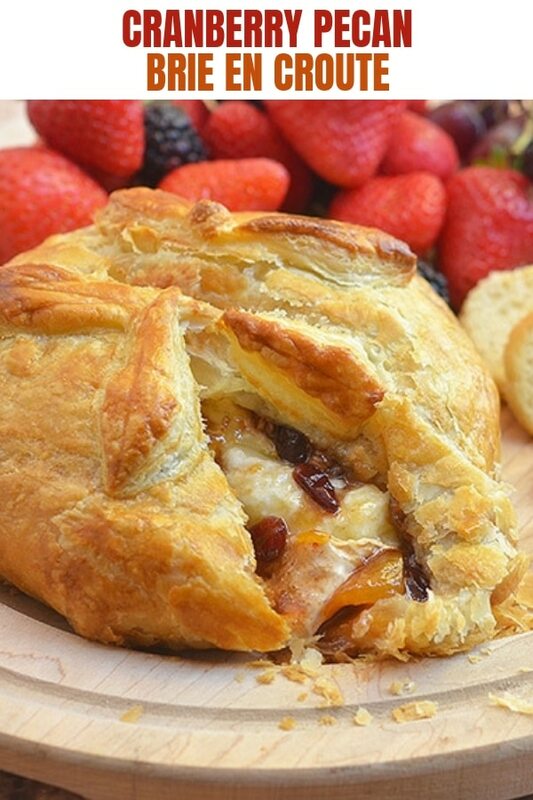 Gather the pastry and the fold up over the cheese to cover. 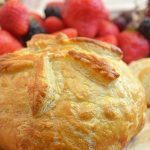 Press the seams to seal and brush with egg wash.
On a parchment-lined baking sheet, place the brie en croute with seam-side down. Decorate with the pastry scraps and gently brush with the egg mixture. Refrigerate for about 10 to 15 minutes. Bake in a 400 F oven for about 25 to 30 minutes or until the pastry is golden brown. If the outside is browning before the pastry is cooked through, move baking sheet to the lower third of the oven. Let stand for about 10 minutes before cutting. 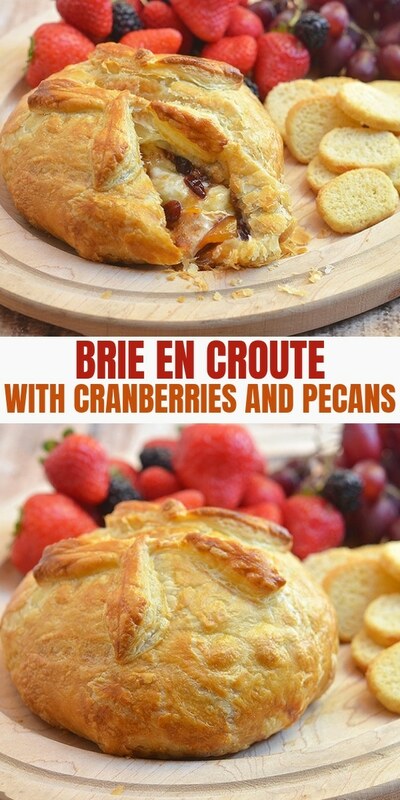 Serve with the assorted crackers and fresh fruit. This looks absolutely delicious. I have never made anything like this but I am sure my family would love it. I have been wanting to try this for a while now. 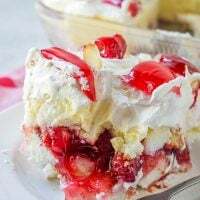 It looks amazing and your recipe is simple enough for me to follow. This is getting made this week! That’s all you need to make it? The pics look incredible! I’ve never thought to add apricot preserves. We typically use cranberries and apples in ours. I have never heard of this before. I think my family will enjoy the recipe, though. Omg can we say yum?!?! I just love brie!!!! 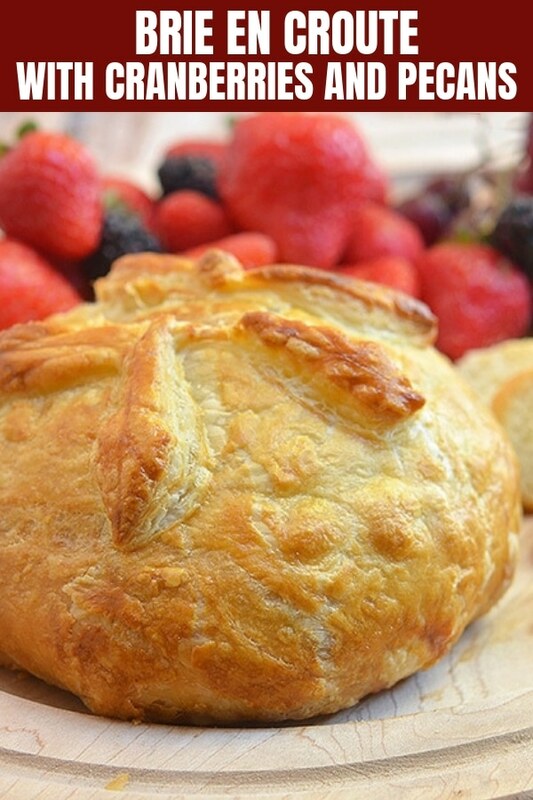 I’m not sure my guests will get a chance to get to it…lol That puff pastry is meant for me to devour. oh this looks really good! I so wanna make it! Please do! It’s so easy to make and it’s such an impressive centerpiece for holiday parties.